Luxury shoppers in the market for a midsize SUV that offers an alluring combination of good looks, premium power, and cutting-edge features will find a lot to love in the 2018 Alfa Romeo Stelvio in Merriam KS. This model is all-new for the 2018 model year, and brings the elite Alfa Romeo luxury line solidly into the crossover market. The 2018 Alfa Romeo Stelvio is available in three models, each with their own character. The 2018 Stelvio and Stelvio Ti models come with a 2.0-liter turbocharged four-cylinder rated for 280 horsepower and 306 pound-feet of torque, while the elite Quadrifoglio brings the thunder with a 505-horsepower 2.9-liter turbocharged V-6. With its 443 pound-feet of torque, this top-of-the-line engine can burn from 0 to 60 mph in just 3.9 seconds. Keep reading to learn about more standard and available features on this premium SUV, or explore the new Stelvio inventory here at Aristocrat Motors by clicking below. 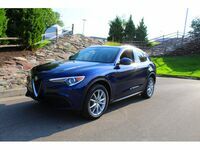 While those seeking power and athletic performance can certainly find their match with one of the models of the 2018 Alfa Romeo Stelvio in Merriam KS, this midsize crossover also offers so much more that can satisfy the most discerning drivers. Intelligent Q4 all-wheel drive is standard on all models, which allows the 2018 Stelvio to offer premium traction even in bad weather. Leather seats, a drive mode selector, leather upholstery, a flat-bottomed steering wheel, and a class-exclusive carbon fiber driveshaft all come standard even on the base Stelvio model. Elite features available with some models include: 14-way powered front seats with power bolsters, authentic wood trim, and aluminum interior trim. Every inch of the 2018 Stelvio offers Italian quality and polish that could only come from Alfa Romeo. When it comes to safety, the 2018 Alfa Romeo Stelvio also offers premium features that can help drivers spend more time enjoy the experience of the road. rather than worrying about obstacles. Advanced safety features on this model include Full-speed Forward Collision Warning-Plus, Adaptive Cruise Control-Plus with Full Stop and Lane Departure Warning, while Blind-spot Monitoring, front and rear parking sensors, and Rear Cross Path alerts are available. Would you like to learn more about the 2018 Alfa Romeo Stelvio in the Kansas City area? Contact a member of the Aristocrat Motors team, explore our extensive new Alfa Romeo inventory in Merriam KS, or request more information below. Interested in a 2018 Alfa Romeo Stelvio?